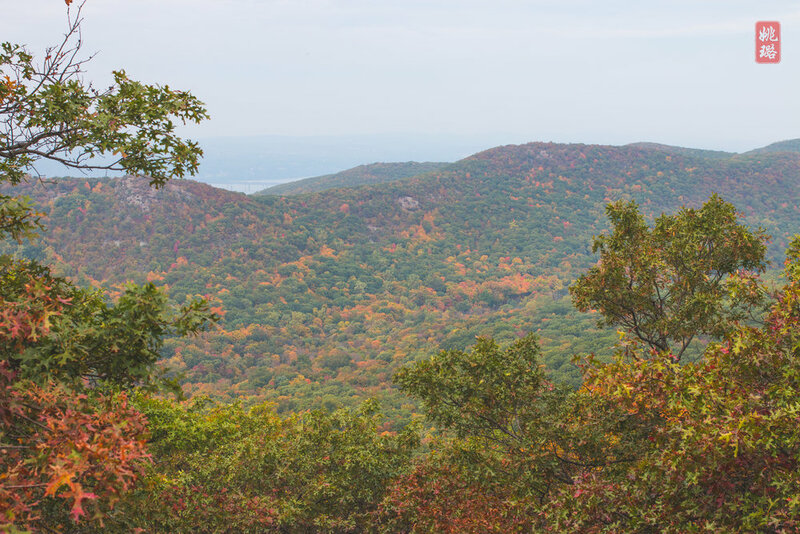 I love hiking in the Hudson Valley during autumn because it looks as if all shades of yellow to green have been splattered across the entire region. 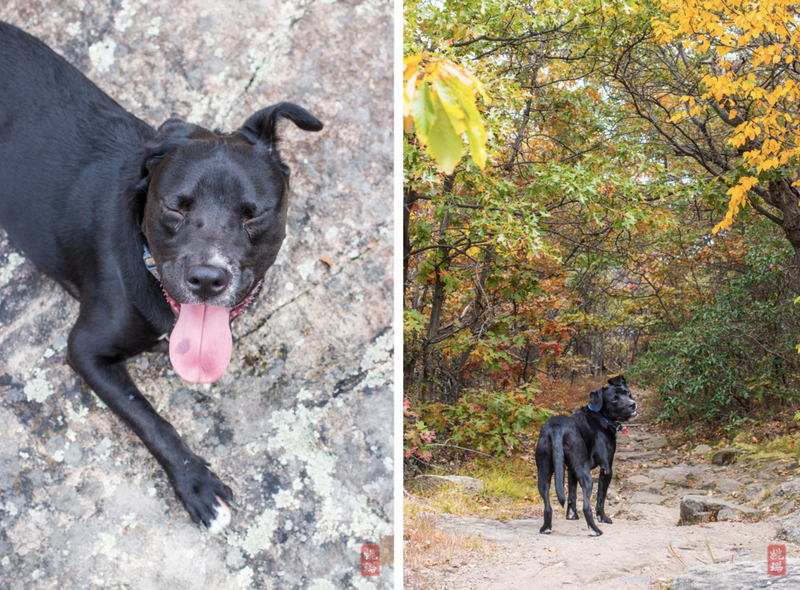 A couple of weekends ago, we decided to go hike at Bull Hill with our friends and Shiraz (his first time doing a long hike!). However, based on the green-colored leaves in Central Park, I thought I was going to be thoroughly disappointed with the colors. But thankfully, things had begun changing up north. The start of the trail was pretty easy, but it later gets steeper and rockier. It was around 80 degrees that day so Shiraz was extra hot and needed a break halfway up. The view at our stop was a beautiful view of Cold Spring covered with a light fog. By the time we actually got to the top, Shiraz completely collapsed... He's definitely a short distance sprinter! We stopped for a picnic on some flat rocks while our baby recovered with water and snacks. Soon enough, he was leading our pack again. We are pretty sure we missed the place at the top where we were supposed to actually stop and ohh/ahhh over the sweeping views of the Hudson. But, we did get to see some views like the one below along our hike. This trail is extremely doggie friendly, and Shiraz had an absolute blast exploring (maybe a little too far ahead) along the trail off leash. He even ended up in a stream, which is unbelievable as he hates water. But the day was hot, and who doesn't like playing in muddy water...? 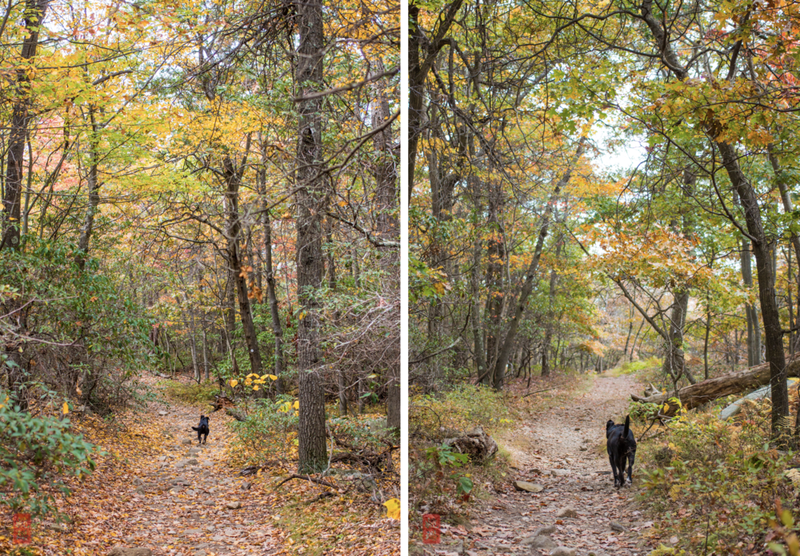 I would highly recommend the long version of this hike on a cool day! There are still a couple weekends left of this autumn for you to get out there. And your pup would enjoy it too! To get there, take the Metro North train from Manhattan (leaves from Grand Central) to Cold Spring Station. Then take a short stroll north on Fair St. to the beginning of the trail. Make sure you keep an eye out for the markers that take you on the short or long trails. Stop for ice cream at Moo Moo's Creamery afterwards if you have time!